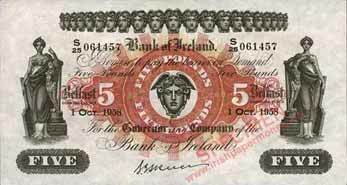 The Bank of Ireland’s first Northern Ireland Issue of 1929 used the same designs as those used in its 1922 all-Ireland Series H, except that the place of payment was altered to 'Belfast Donegal Place' instead of 'Dublin'. Serial numbers were restarted for Series I. This series remained in use for over thirty years. There are two design varieties and four signature variations for Series I banknotes, giving five basic TypesA through E.
Type A 1929. Signature J. H. Craig. £1, £5, £10, £20. Type B 1933-1940. Signature G. W. Frazer. £1, £5. Type C 1936-1940. Signature G. W. Frazer. £1. 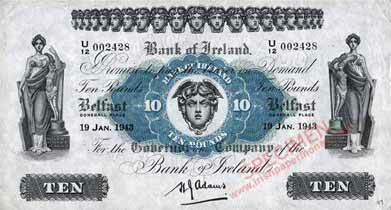 One Pound note underprint design changed from green to blue on the face and reverse, halfway through the print run of £1 notes dated 9 March 1936. Type D 1942-1943. Signature H. J. Adams. £1, £5, £10. Type E 1958. Signature S. G. Skuce. £5. BI1. 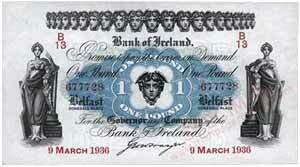 £1 notes [1922-1928] Prefix starts anew at B10. 150 x 85 mm approx. BI2. 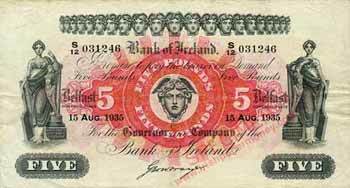 £5 notes [1922-1928] Prefix starts anew at S10. 175 x 95 mm approx. BI3. 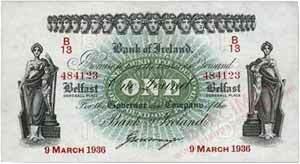 £10 notes [1923-1925] Prefix starts anew at U10. 195 x 105 mm approx. BI4. £20 notes  Prefix starts anew at X10. 205 x 108 mm approx. All the dates have been recorded for Series I: £1 Notes, 12 dates; £5 Notes, 17 dates; £10 Notes, 4 dates. 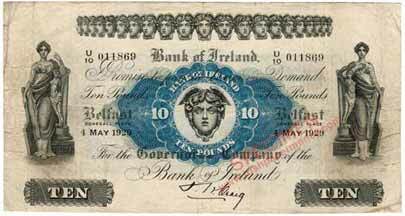 Examples of all the recorded dates for Series I can be viewed in the Bank of Ireland First Northern Ireland Issue date listing 1929-1958.